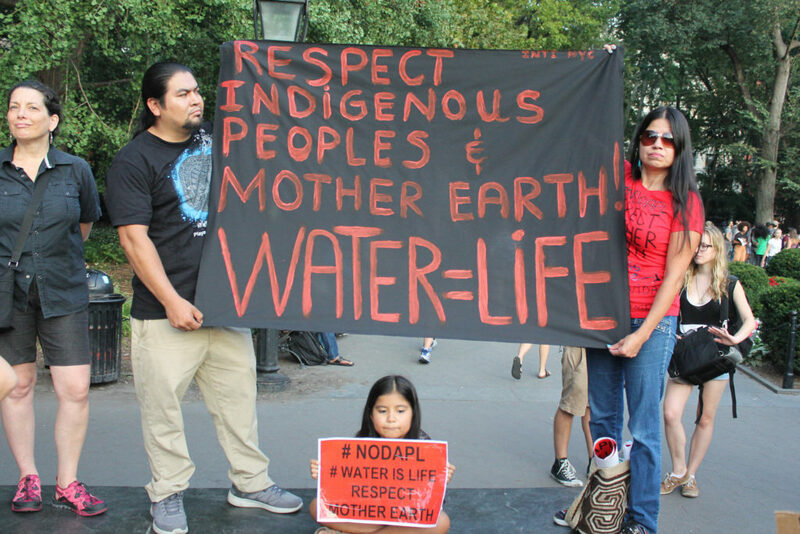 New York City rally in support of Standing Rock Water Protectors. Source: Joe Catron, Flickr. The actions, protest, and resistance in Sioux Nation Territory among Indigenous people, ENGOs, and other allies in North Dakota in recent months echo what Paul Sabin once referred to as “voices from the hydrocarbon frontier.” Once again, Indigenous people stand on the front lines of opposition to the development of a major energy pipeline infrastructure project in North America. 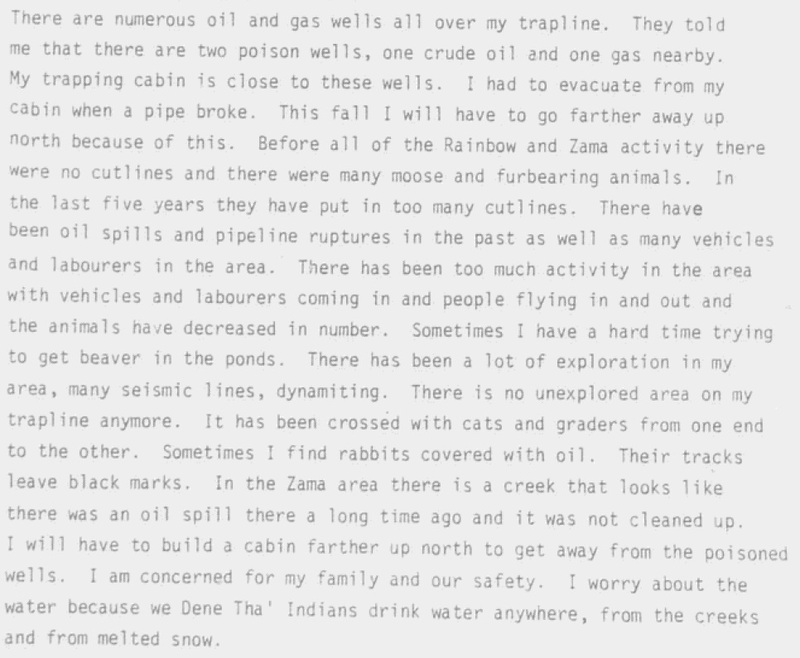 The conditions and issues, of course, are different from those expressed by Inuit, Dene, and Métis people during the Berger inquiry into the development of a gas pipeline in the Mackenzie Valley in the 1970s, but some of the sentiments still resonate today. The emergence of the #NoDAPL movement and the prominent and leading role of Indigenous people is part of a now decades-long phenomenon of Indigenous people’s efforts to resist energy megaprojects in their traditional territories. In my own work on the history of long-distance oil pipelines in Canada, I’ve found that some of the adverse environmental consequences of oil pipelines (in the form of oil spills) likely disproportionately affected rural environments and the lives of rural Indigenous and settler populations. Given the historical geography of oil pipeline spills in Canada, it was no surprise to me to find Indigenous people among the most prominent voices to warn against the environmental risks of energy pipelines. Those voices spoke out against the potential risks of constructing an oil pipeline in the southern Mackenzie Valley in the 1980s. In 1980, Interprovincial Pipelines Inc. or IPL (now Enbridge) submitted an application to the National Energy Board (NEB) for a certificate to construct an 868-kilometre small-diameter oil pipeline from Norman Wells, Northwest Territories to Zama, Alberta. The pipeline would carry increased production of crude oil from Norman Wells to a transfer point in Zama where it would then flow south in the Rainbow Pipeline to refineries in Edmonton and on to southern markets in Canada and the US. 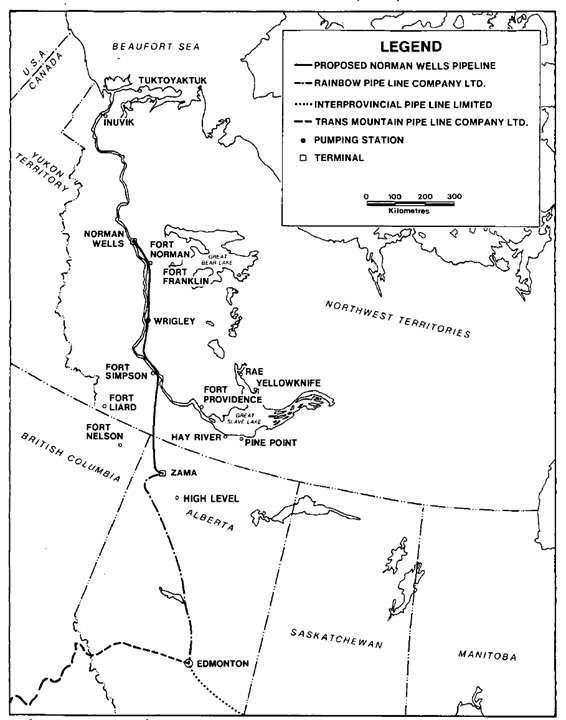 Map of proposed route of Norman Wells Pipeline, 1981. Source: National Energy Board, Reasons for Decision, In the Matter of an Application under the National Energy Board Act of Interprovincial Pipe Line (NW) Ltd., OH-2-80, March 1981, p. viii. The testimony of these men and others spoke of lived experiences in a rapidly changing environment. They contested the meaning of environmental impact and inserted their own experiences of environmental degradation and loss into the debate over the construction of this oil pipeline. Indigenous people then, of course, did not speak in one voice. Some welcomed development in the north but fought to share some of the economic benefits of that development. They spoke of environmental rights rooted in an assertion of sovereignty. While the debates over oil pipeline development today draw in a wider range of global environmental issues, the recent events in North Dakota should remind us that local Indigenous voices continue to play a powerful and influential role. Those voices today carry with them a history of Indigenous resistance to energy megaprojects in North America. [i] Interprovincial Pipeline (NW) Application to the National Energy Board. Exhibit No. 118. Evidence of Dene Tha’ Band, Testimony of Henry Mercredi, through an interpreter, 1. [ii] Interprovincial Pipeline (NW) Application to the National Energy Board. Exhibit No. 118. Evidence of Dene Tha’ Band, Testimony of Pierre Bassa, through an interpreter, 1. [iii] Interprovincial Pipeline (NW) Application to the National Energy Board. Exhibit No. 118. Evidence of Dene Tha’ Band, Joseph Etchillay.